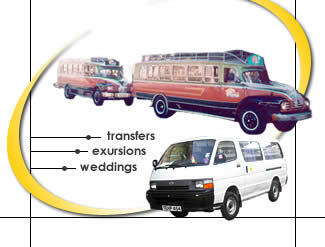 We have different size minibuses that can be hired with a driver. Price is according to season, length of hire, whether you want a qualified guide and availability. Legislation says that in order to drive a minibus in Cyprus, you have to have special license so self drive is out. If there is a group of you who want to do excursions, this is one of the options you should consider, as your trip will be more flexible and last longer at the interesting places than with a standard coach trip, and you will find that the price is the same or cheaper for 6-8 + of you. We also have air conditioned coaches and the classic ' chicken busses' for special occasions, weddings and the larger group bookings. Please enquire specifying the dates/times/number of passengers for a quote. We have friendly, knowledgeable drivers who speak very good English. Cyprus Car Hire - Minibus - coaches - chicken busses - wedding transport and individual coach excursions page.